Angelika Kratzer’s area of specialization is semantics, an interdisciplinary field located at the intersection of linguistics, cognitive psychology, logic, and philosophy. Her research concerns how natural languages are constructed so as to make it possible for humans to assemble complex meanings systematically ﻿from small and simple pieces. Natural languages allow humans to talk about the merely possible: what might have been, could be, or should be. Human notions of what is possible, inevitable, likely, or desirable are fundamentally the same and highly systematic, and this is why they have attracted the attention of mathematicians, logicians, psychologists, and philosophers for more than 2,000 years. As a linguist, I investigate how natural languages around the globe organize talk about possibilities. Angelika Kratzer received her PhD from the University of Konstanz (Germany). 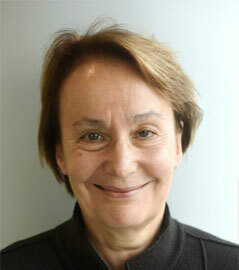 She has been a guest professor around the world and is a fellow of the Linguistic Society of America. With Irene Heim of the Massachusetts Institute of Technology, she is co-author of Semantics in Generative Grammar and cofounder and coeditor of Natural Language Semantics. She is often called to serve on advisory boards and panels for research institutes and initiatives, departments, and journals to develop directions for interdisciplinary research in semantics for the 21st century.